Who doesn’t LOVE Jamba Juice?? MMM. Since my friends somewhat ridiculous obsession with pomegranates, I have found myself ordering such when it comes to juice, martinis, smoothies, margaritas, yogurt…. I wouldn’t be surprised if they started making pomegranate chips… ew. But My favorite JJ Smoothie is Pomegranate paradise which is basically pomegranate, strawberries, mango and peaches. So go grab a friend and get SOME. 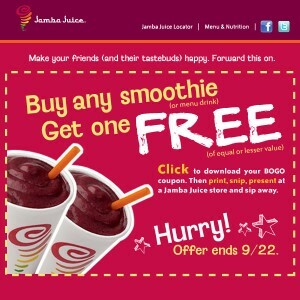 Jamb Juice for breakfast, Jamb Juice with your mom, Jamb Juice for dinner, Jamb Juice with your homies, Jamb Juice instead of Mcdonaldo’s, Jamb Juice with yo man, Jamb Juice instead of Coffee Bean, Jamb Juice with your tonsils out, Jamb Juice before the dentist, Jamb Juice at the Mission Viejo Mall, Jamb Juice for under $4, Jamb Juice after class, Jamb Juice on a date, Jamb Juice for people with no teeth, Jamb Juice if you don’t like eating fruit– only drinking it, Jamb Juice if you have some lbs. to lose, Jamb Juice instead of weight watchers, Jamb Juice with a lid for kids that spill, Jamb Juice if you don’t take vitamins, Jamb Juice in orange county, Jamb Juice international, Jamb Juice if you are Alexis Hay.